Book talk: What would you do if the moon went missing and you were the only one who could hear its cries? Rendi is surprised that no one else seems to mind the missing moon or hear its moans at night--but what can he possibly do about it? Maybe once he could have got someone to help, but now he's on his own. After being caught as a stowaway he's stuck working as a chore boy at a small inn in the middle of nowhere. He doesn't want the inn's guests to think he's crazy and the inn keeper's daughter doesn't like him anymore than he likes her. But when a mysterious new guest arrives and starts telling stories suddenly the sleepy town turns into a bed of action. With mysterious toads, kidnappers, and fights over snails, Rendi realizes that he is in the middle of an exciting story of his own--and it's up to him to make sure it ends happily. Rocks my socks: Much like Lin's Where the Mountain Meets the Moon, this novel has short stories placed throughout the main narrative. They are set apart by a different font and special headers and they are positively enchanting. The main narrative in this story has more meat to it though and I loved the way all the characters' separate stories were revealed and connected. Each character has lessons to learn before the moon can be restored to its rightful place and they are all touchingly portrayed. The character who makes the biggest progress however is, as it should be, the protagonist Rendi. He doesn't start out as a like-able character but through the course of the novel he finds himself letting his guard down and changing in spite of himself. This sets the novel apart, especially for one aimed at such a young audience, and I admire Lin for making Rendi the lead. The novel is illustrated throughout and even the rough versions in my advance reading copy are beautiful. I can't wait to see the final versions when the book is published--I'm sure they'll be a real treat. Of course the language is as beautiful as the illustrations--this a book to own and store proudly on your shelf and take down for multiple re-readings at bedtime. Every book its reader: I'd recommend this to fans of fairy tales looking for a chapter book to read. Those with an interest in Chinese culture and folklore will be particularly interested in this book. Fans of Where the Mountain Meets the Moon will be delighted by Lin's latest. It would make a good read aloud for younger children but for independent reading I'd save it for 3rd graders and up. Grace Lin has a charming blog with a lot of extras including the process of making the illustrations I'm so excited about--how could this frog picture not intrigue you? 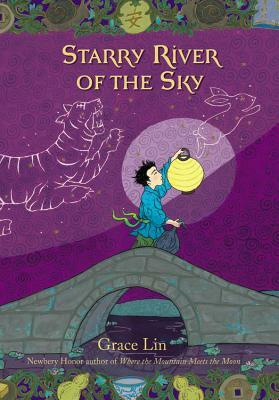 Starry River of the Sky by Grace Lin: Buy it or check it out today!